MONGKOK, Hong Kong - Aug. 28, 2018 - PRLog -- Filipinos' love for beauty pageants was embedded in history after its concept was introduced by the Americans before the World War II era. Today, despite being away from home, Filipinos love to participate in pageants either as a contestant or a spectator. For the overseas Filipinos in Hong Kong, one of the beauty pageants they are anticipating every year is the "Ms. Barkadahan", organized by SmarTone Mobile Communications Limited, the leading telecommunications company in Hong Kong. To make the pageant journey more memorable for the Filipinas, ABS-CBN Global, through The Filipino Channel (TFC), will be the exclusive TV media partner of SmarTone in the upcoming "Ms. Barkadahan 2018". This is the first partnership between the two big companies that share the same goal which is to highlight the overseas Filipinos' stories of triumphs while living in a foreign land. "SmarTone is excited with this partnership with TFC for Ms. Barkadahan 2018 as this will bring a new level of experience, not only for the candidates but also to the public. Both SmarTone and TFC are market leaders in respective fields, creating a synergy that will enrich the lives of overseas Filipino workers in Hong Kong by serving them with superior mobile services branded 'Barkadahan sa SmarTone' and relevant entertainment content," said SmarTone Assistant General Manager of Marketing Division, Ms. Cindy Leung. On the other hand, ABS-CBN Global Asia Pacific Regional Marketing Head and Country Manager for South Asia Maribel Hernaez stated: "We are glad to be one with SmarTone and the Filipino Community here in Hong Kong as we put the spotlight on the overseas Filipinos via 'Ms. Barkadahan 2018'. This contest does not only showcase the candidates' beauty and wit, but gives them the opportunity to become models of success that will inspire many others to become whoever they want to be in this world." "Ms. Barkadahan" has been an annual Filipino community event in Hong Kong for over 10 years now, where 12 Filipinas compete with each other to win the "Ms. Barkadahan 2018" crown. The pageant will happen on September 23 at the MacPherson Stadium, Mongkok in Hong Kong. Before they grace the pageant stage, get to know the 12 candidates by checking out their profiles at the "Ms. Barkadahan 2018" microsite (https://missbarkadahan.mytfc.com/). They will also touch your hearts as they share a glimpse of their life stories and preparations for the pageant. Aside from the "Ms. Barkadahan 2018" title, the public is also given the power to choose who they think deserves the Bb. Kapamilya Barkadahan 2018 award. This award is for the candidate who embodies the Kapamilya spirit, where she goes beyond what was expected from her during pre-pageant and sets an example to others by doing and being her best in everything she does. The winner of the Bb. Kapamilya Barkadahan 2018 will be chosen based on 80% online voting and 20% judges' scores before the pageant day. To vote, simply visit and create an account at https://missbarkadahan.mytfc.com/. Only one vote per account in a day is allowed. Making the night brighter is the performance from one of the Philippines' talented actors, Joshua Garcia, and the Unkabogable Sidekick (undisputed sidekick) Negi. 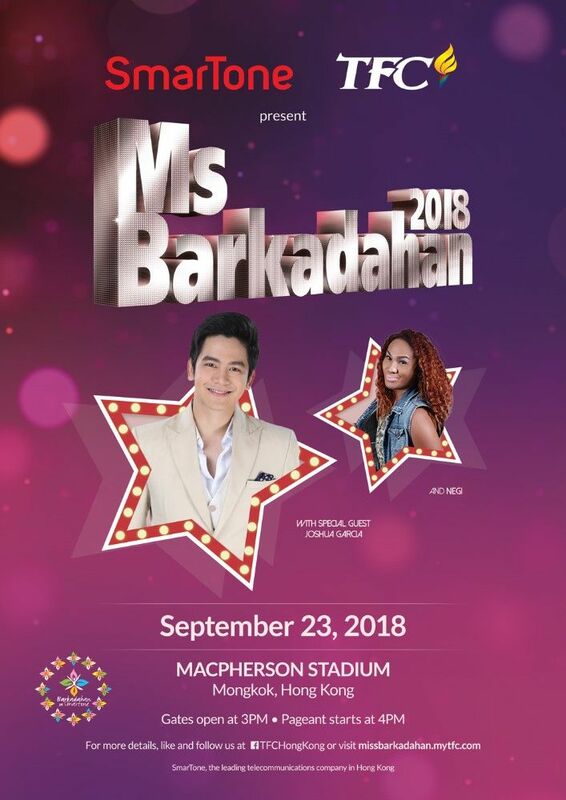 For more updates about the "Ms. Barkadahan 2018", visit https://missbarkadahan.mytfc.com/, facebook.com/TFCHongKong or facebook.com/barkadahansasmartone (http://www.facebook.com/barkadahansasmartone). Connect with fellow global Kapamilyas and follow @KapamilyaTFC and KapamilyaGlobalPR on Twitter and Instagram.